210 x 153 mm. – 118 leaves. 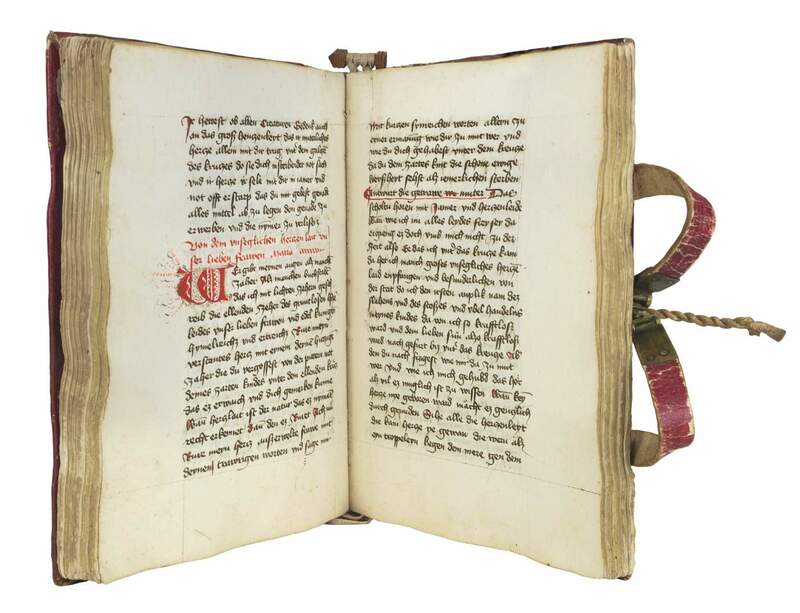 This mystic text is signed and dated by the scribe Johannes Rosengarth (mentioned on f. 111v), who made it for the Dominican convent of St. Catherine in Nuremberg. The text in this manuscript is a practical guide to meditation and mystic contemplation on the Passion of Christ written ca. 1328 by Heinrich Suso, Dominican friar and German mystic (ca. 1295-1366). Suso, or Seuse, disciple of Master Eckhart and friend of Johannes Tauler, is one of the most prominent mystics of German history and his Little Book of Eternal Wisdom was the most widely read meditation book in the German vernacular throughout the 14th and 15th centuries. The work also exercised influence upon spiritual writers and is considered to be one of the ‘most beautiful fruits of German mysticism’. Among the Friends of God (Gottesfreunde) in the region of Strassbourg, Alsace, Suso’s texts also played a vital role in the work of restoring religious observance, particularly influencing convents of women. His work, therefore, is a primal witness to Dominican observance, spirituality, and piety. This work is now in the collection of the Stadtbibliothek in Nuremberg.